The Defender Chrome Stripe Riding Helmet features matte Polycarbonate and Advanced ABS Composite outer shell; injection molded shell design; washable quick-dry, moisture wicking, anti-microbial liner; stainless steel mesh; comfort padded harness with synthetic suede lining, hook & loop adjustment, and Fastex buckle; two side, two front, one back, and two center stripe vents. One K™ English Riding Helmets boast the perfect synergy between advanced technology and aesthetically pleasing design. With enough features to appeal to those seeking everything a helmet could possibly offer, wrapped in a package that traditionalists can appreciate, One K™ has the best of both worlds. Certified to ASTM standards. One K Defender Chrome Stripe Helmet is rated 5.0 out of 5 by 4. Rated 5 out of 5 by Fathom13 from Comfortable helmet with great fit! This helmet fits so well and is super comfortable! It is quite light and cool. 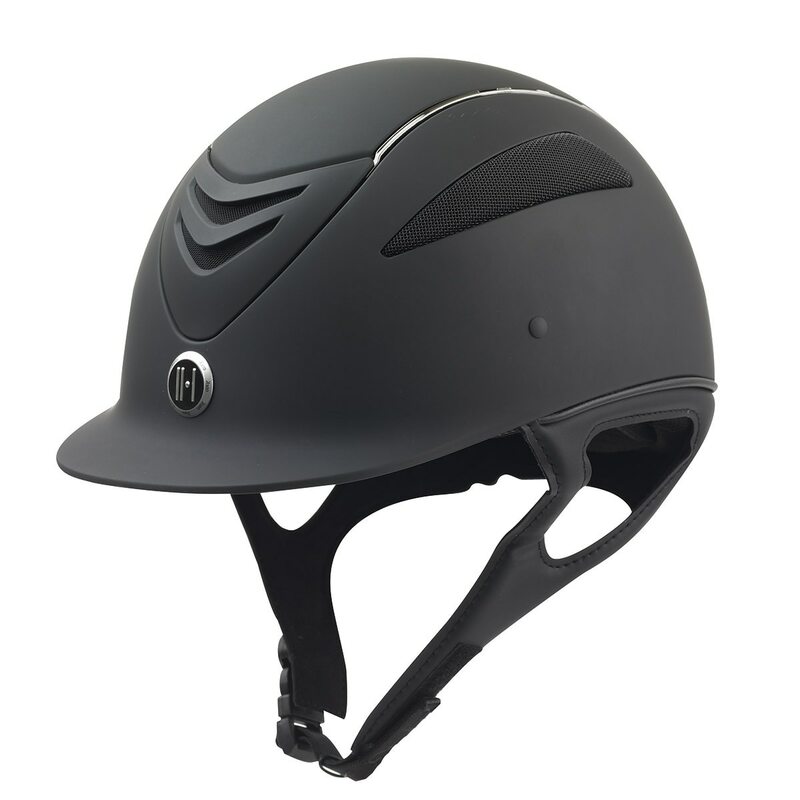 Rated 5 out of 5 by 907dressage from Great helmet at a great price Really love the look and feel of the One K Defender with Chrome stripe. Very comfortable and love that it comes with two removable liners. The removable liners were the main selling point for me. Would highly recommend this helmet to anyone. It looks very similar to the Samshield helmets at half the cost. Rated 5 out of 5 by Breana from so comfortable I was in the market for a new helmet as I had mine for 5 years. I have always wanted a One K helmet. I bought the oval helmet and it fits me like a glove. Its super pad inside and it keeps my head super cool. I feel so much safer in this helmet.